Twice Upon A Year Sale - Up To 40% Off! You are here: Home / Great Deals / Twice Upon A Year Sale – Up To 40% Off! Twice Upon A Year Sale – Up To 40% Off! The Disney Store is having it’s Twice Upon A Year Sale! All items are up to 40% off. That includes clothes, costumes, toys, collectibles and more! The Avengers Swim Trunks for Boys are only $12.99! Your aquatic super hero will be able to battle the currents with these Avengers Swim Trunks for Boys. Captain America, Thor, Iron Man, and Hulk team up on this swimwear that provides UPF 50+ UV protection. The Elsa Swimsuit for Girls is only $12.99! After an eternal winter, what better way to relax than enjoying fun in the sun at the beach or pool. This Elsa Swimsuit for Girls features Frozen‘s icy maiden, glittering silver trim, and provides UPF 50+ UV protection. 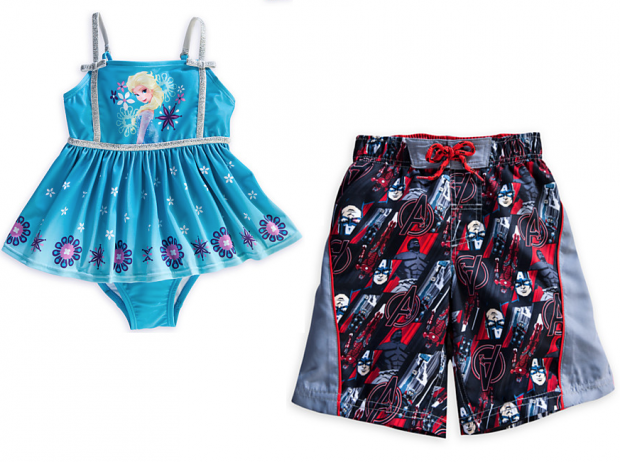 You can get either of these item in the Disney Store Twice Upon A Year Sale! Filed Under: Great Deals Tagged With: "The Disney Store"